if we’re hauling trailers, tag it with this. Weather-permitting, the mobile repair trailers will see sunshine again on Sunday, April 19th in Kerrytown. Dust your sled off. Ypsi Spring Ride: Sunday May 3rd, 2015, 9 AM – ? We’ll be setting up one of the MRS trailers at the start point of the Ypsi Spring ride this year to support the riders. Details and schedule available on the BikeYpsi website. Roos Roast and CC will be serving up caffeinated drinks, an array of snacks and assistance with any mechanical hiccups during your commute. More details (including all of the Bike to Work Day stations) here: getDowntown. CC will be assisting the Ann Arbor Y and Safe Kids of Huron Valley with their annual Healthy Kids Day event. 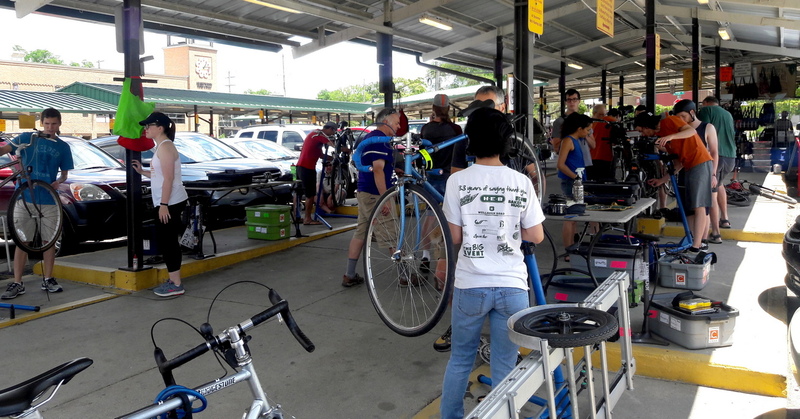 We will be on-hand running a bicycle rodeo and bike-wash, giving away some cycling accessories, and helping teach families about safe riding and keeping their bikes running smoothly all year. We need your help – please get in touch with us if you would be interested in volunteering as a mechanic or would like to help run the rodeo, bike wash or would generally like to share enthusiasm about riding bikes with local children. Feel free to email us at info@commoncycle.org if you have questions, or are interested in volunteering!